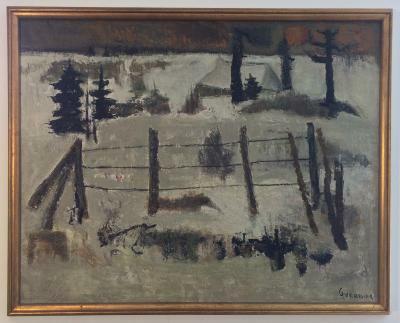 Guerriers distinct artistic vision which first came to public attention in 1953 when he was awarded the Prix de la Jeune Peinture. A largely self taught artist who had spent years studying the great works in the Paris museums, particularly Goya and Cezanne, before first exhibiting at the Salon dAutomne and Salon des Indépendants in 1947. His work at this time, typically for the post-war atmosphere, consisted of a semi-figurative style painted in a muted palette that had affinities with the Forces Nouvelles movement. In 1952 he was taken on by Galerie Stiebel and given his first solo show, the success of which lead to regular subsequent shows throughout the fifties. In 1953 he had a solo show at the Redfern Gallery in London and again in 1955 when he also participated in the “French Painters” exhibition in Tokyo. By 1957 he was already holding his first exhibition in America at the Hammer Gallery in New York. During this period he also exhibited at the biennials of Turin, 1955; Menton, 1957; Paris, 1957, and was awarded the title of Chevaliers des Arts et Lettres. 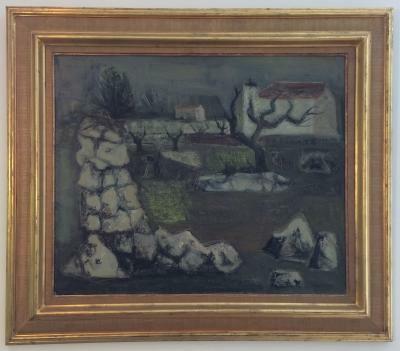 Towards the end of the 1950s Guerrier moved from Paris to Provence and spent a substantial amount of time travelling to Spain, Greece, Morocco, Jordan and Israel. His experience of these cultures, the arid spartan landscapes and brilliant light, seems to have had a significant influence on his painting which became more minimalist with increasingly abstracted forms and cleaner more radiant colours. “What his painting lost in gravity, it gained in serenity. His paintings became calls, so to speak, to meditation, to contemplation,” (Pierre Basset). This new development was celebrated in 1962 at a major show in Geneva at the Galerie lAthénée and he continued to hold numerous other exhibitions throughout Europe, also in Venezuela in 1964 and Buenos Aires in 1970. The artists work is now represented in many museums including the Musée National d’Art Moderne in Paris and the Musée dArt Moderne de la Ville de Paris, and the Museums of Poitiers, Pau, Calais, St.-Denis, Marseille (Cantini) and Le Havre (Musee des Beaux-Arts); as well as the national art collections of Venezuela, Japan, Luxembourg and Belgium.